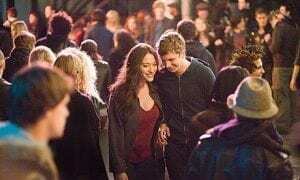 Nick and Norah’s Infinite Playlist may rub many the wrong way, primarily because seeing Michael Cera play yet another straight edge, hipster, sad-sack geekily fumbling through adolescence is a test of patience. But, let it test you. Nick (Michael Cera), bassist and only straight member of all gay rock band, The Jerk Offs, pining after evil ex-girlfriend Triss, spends a Manhattan night chasing elusive, super-cool, secret gig playing band, Where’s Fluffy? with quiet, sad-eyed and beautiful Norah (Kat Dennings). Of course, over the course of the night, skinny jean sporting Nick and adorable Norah realize they are as into each other as they are the band they so desperately want to see. The premise feels a little contrived, the characters are a little over done, and many of the plot points work on coincidence, but that being said, there are some fabulously funny moments and you can’t help, but enjoy being in the company of Nick, Norah and crew. There is an underlying charm to Infinite Playlist that is youthfully romantic and optimistic. It’s a film that will leave you feeling warm inside and with a big smile on your face. As much as Mike Nichol’s The Graduate, released in 1967, is a film that spoke both of and for a new generation and a changing America, it is timeless. Benjamin Braddock (Dustin Hoffman), graduate returnee and aimless (inflatable lilo) drifter is seduced by Mrs. Robinson (Anne Bancroft), the restless dissatisfied wife of one of his parent’s friends. The affair soon turns salty when Benjamin falls for Mrs. Robinson’s daughter, Elaine (Katherine Ross), a true connection is made and a sense of purpose and kinship injected into Ben’s slowly stagnating existence. This was Hoffman’s first film and it put him on the map, his performance is stellar as the fumbling, conflicted, angst ridden Ben and Nichol’s direction is sublime, from photography to editing; it’s a feast for the eyes. The Graduate is a tremendously funny tragi-comedy with a Simon and Garfunkel score to boot. Submarine, Richard Ayoade’s debut feature film, is a Swansea set, coming of age tale based on Joe Dunthorne’s novel of the same name. 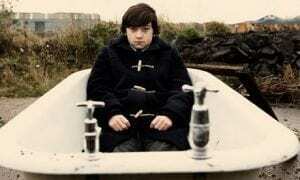 Overcoat wearing teenager, Oliver Tate (Craig Roberts), grapples with his parents failing marriage and the awkward romance developing between him and classmate Jordana (Yasmin Paige), the clumsy by-product of Oliver’s attempt to lose his virginity by the end of the year. It’s dark, deeply funny and feels tender without being saccharine. It’s as much a love story as it is an ode to Ayoade’s love for film. Submarine is swims in the waters of the French and American New Wave, Wes Anderson, Scorsese, Chabrol, Truffaut – the list is endless. It’s self- conscious and confident with Ayoade not just aping style, but injecting it with his own. and presented with such kinetic visual flair. Theirs is a first love doomed by warring families, set in a contemporary Verona (beach), a cinematic fantasy land that mixes the worlds of Los Angeles and Mexico City, complete with rapier branded handguns and long sword semi-automatic rifles. This is a heightened, artificial world that maintains the original iambic pentameter, acted with heart breaking emotion and delicate, youthful yearning from both DiCaprio and Danes respectively. Set on the fictional Island of New Penzance, another distinctly Wes Anderson world, this time steeped in 60’s nostalgia and the memories of hot childhood summers. Bob Balaban, playing an amusing, quasi-hipster-meteorologist, narrates the story, with omniscience second only to God, of delinquent orphan Sam (Jared Gilman) and different, difficult Suzy (Kara Hayward) as they fall in love and elope, he from scout camp, and her from home, to a beach in one of the far off corners of the island. Anderson offsets the innocence of his adolescent lovers with the disarray the adult world falls into when they discover the kids have done a runner. It brings to life Sam and Suzy’s resolve to be together and the short-lived promise of the possibility and optimism of youth. Moonrise Kingdom possesses all the charm and quirk that has come to define Wes Anderson’s films. It is directed and shot in his signature style, frontal cinematography, meticulously dressed sets and characters and attention to colour. It’s a beautiful film that possesses a fantastical quality that’s very easy to fall in love with.